Today I haven’t painted a single brush stroke. I’ve been so unproductive and lazy I forced myself at around 4:30pm to bike down to Grand Prix hobbies to buy some styrene. I’ve been hanging out more on the Waaagh and I want to get my Looted Wagons armed correctly and fully painted for this edition of Warhammer 40,000. I also plan to do at least two Battlewagons which will be converted and kitbashed but first I need a new job. I actually have a job interview Tuesday afternoon. However I have my doubts about the position and the job offer. The company is a startup and although I’m totally willing to work for a startup, I don’t know what they actually do or how they plan to make money, besides the ever trendy “social media“. Seems to me that the social media field is a lot more crowded than it was three or better still four or five years ago. I know as I’ve been blogging for a long time. Anyway we’ll see what the CEO has to say. I couldn’t pass up the battlefield styrene. I’ll probably cut one of them up. The tubes will also serve as pipes and what not, but some may get turned into gun barrels. I wanna order some more paint and of course Forgeworld goodies, but first I have to paint some Diseased Sons, then assemble and paint some more Chaos Space Marines, then two Forgeworld models… Then maybe I won’t feel guilty buying some small Forgeworld stuff. Waaagh Musk 40K, requires lots of touch ups, and re-armings. Last night I did further revisions to the army list, I added and removed some vehicle upgrades, and I think one of my dreads will get a weapon swap, and I might as well give the Blood Axe nob a powerfist too… It might sound like a lot but there isn’t very many Orks in Waaagh Musk at 1500 points. I do have to do up five large vehicles, which I usually hate to do, but Ork vehicles can be made a lot funner and less work through heavy drybrushing and crazy weathering techniques. Stay tuned, I might paint something late at night. Last night while I couldn’t sleep I tried out the Vallejo paint on gloss varnish, it worked great on the Bloodletter’s horns. If not tomorrow I will begin work on the last Purple Plaguemarines/Nurgle renegades I will ever paint, I mean it this time. As mentioned yesterday I actually got out the Ork Codex and wrote out a 1500 point army list. I tried to use as many of the painted models as I could legally, but I also left room for some new conversions and the new kits, particularly the Trukk and Battlewagon kits GW has released over the last couple years. Once again I couldn’t sleep last night, so before taking a pill, I wrote a slightly different and more flexible army list. This list isn’t 1500 points, it is 1392 points. It is the core of Waaagh Musk for the next year or two. It still has two Big Meks and still has two Dreads as Troops, it still has too mobs of Shoota boys, and two Looted Wagons. What it doesn’t have is either Burna Boyz or Lootas. Both seem good to me, most stuff in the Codex seems good, though obviously I’ll learn the hard way that BS 2 isn’t as good as BS 4. Oh well, this army is most definitely just for fun. Orks are the fun army, the comic relief army, and I’m going to try and have some fun building and converting my army to work with this Codex and 5th Edition Warhammer 40,000. Tonight I have modest dinner plans, but who knows when they will end. I also did the laundry today, but minutiae like that isn’t why people come to my blog. I’m still painting grots. I’ve decided to finish off the two nicer ones today and leave the third one at the end of the paint queue to be finished at a more leaseieruely pace. I’m paint the black parts black with my now traditional Foundry Charcoal Black Triad plus Badaab Black wash system. I’ll probably highlight a tad more. The grey jerkin just got a wash of Badaab Black. Again some people drown grey in black wash and then call it highlighted black, that isn’t really my style. I plan to paint on some highlights but I’ll take a picture first. After the black/grey jerkins and boots, all that requires painting is the skull, the belt and ammo pouches, and of course eyes and teeth. Totally doable in an hour or so. So I’m not sure when but this evening I’ll publish this blog post with shots of the finished models and update Flickr. This army will score higher in Astronomi-con army comp as it only has one Elite choice. It currently has no Fast Attack choice but I plan to try out all of them except Storm Boyz. My unfinished Storm Boy conversions which I forgot I even started have been demoted to ground pounder status. All my red, black, and white models are in one big mob. I actually took four one piece metal models out of that mob last night and put them with the models I plan to strip, as they had shootas not sluggas in the current parlance. That squad is 20 strong now and has two big shootas. That squad has no Nob as all the white, black, and red nobz and all the oddboyz are on another shelf. Some of them will get used I’m sure, but I have so many unpainted models both OOP and from AoBR that it will be hard for me to use all of them under the current rules. Oh well I’ll touch them up and update their bases. I looked at the pictures in the Codex and heavily armored Nobz, Big Meks, and Warbosses get 40mm bases, not all nobz, though some follow that practice. I might but I need a lot of 40mm round bases. I have so many things I want to paint, we’ll see when the Blood Axes, who I plan to do first, finally make it on to the painting table. I’ll eventually be doing a lot of new Nobz and Fast Attack choices including some Deff Koptas as I like to outflank and I think anti-armor despite the ordnance, the Shokk Attack gun, and lots of rokkits already… Anyway I have six Deff Koptas so I may paint up five, though they are expensive. Orks at least have lots of Power Klaws, though I only have two in my army so far, I’ll put one on a Warbikker Nob for sure. So today hasn’t been the best day for hobby progress. 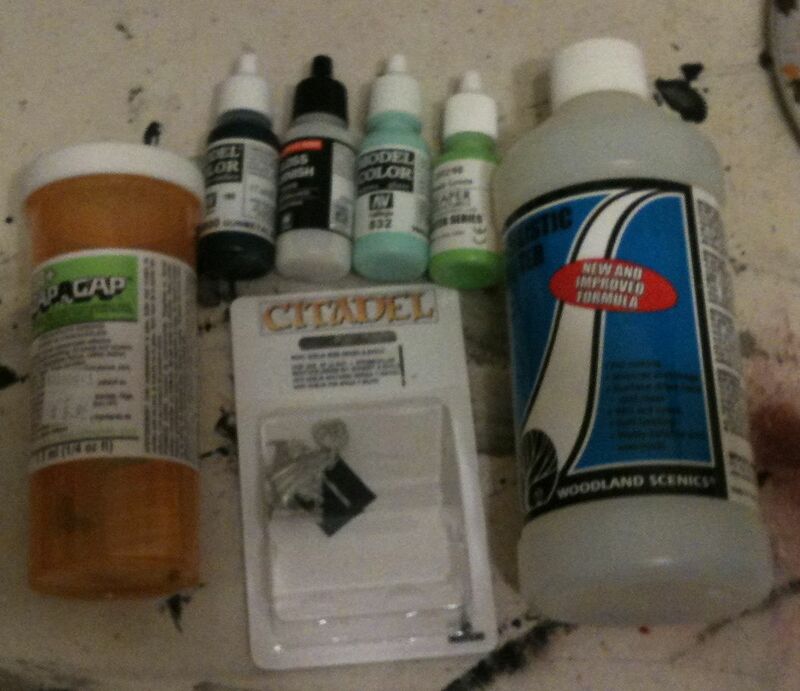 I slept in, but I did go to Richmond and Imperial Hobbies to buy some more paint and stuff. Last night while I couldn’t sleep I finally made an actual army list for Waaagh Musk 40K. This is my old Space Ork army from Rogue Trader and 2nd Edition. With the exception of painting two Gorka Morka gangs, I haven’t used any of those figs for years. When the last codex was rumored to be coming out I started to think what it would take to get my army back on the table. I made plans, I bought stuff. I never made an army list though I did realize that even with just the painted and partially painted stuff I have a full Force Org chart worth of stuff. Of course a lot of my models are illegal or at least not quite right. A lot of heavy weapons will need to be swapped, vehicles will need to be modified, new HQ will be in order, but the actual amount of work is less than the Servants of Decay and it requires negligible special orders and no major purchases, maybe three kits and a single blister would be enough. If you read that and said it wouldn’t score very well in Astronomi-con Army Comp, you’re over thinking things. This is an army that hasn’t been used in a decade that was cobbled together under way different rules and will be kitbashed into legality. When I learned I could use dreads as troops if I took Big Meks I was all over that, but I’d probably be fine with one less Mek, maybe even just a simple Big Mek on foot would be best, then I could afford more Warbikes, Burna Boyz, Skorchas, possibly even a Nobz Mob in a Battle Wagon. I might do that all sometime down the road, but the official target army list for Waaagh Musk is listed above and detailed over on the Waaagh. I still plan to do the Servants of Decay army. I’ll be painting another test figure for it over grey primer someday soon. However as someone who is still unemployed, though I did apply to at least three new jobs today, placing a large order to Forgeworld is a ways off. I need some Forgeworld goodies for my Chaos Spacemarines, or at least I’d like a Rhino conversion kit and the Bezerker Terminator bits. Those would figure into my 2011 Astro-Van army. I need a lot of stuff for the Servants of Decay hundreds of dollars worth of stuff. I could paint 100 orks and not have to buy a model, but to field the army listed above will require a few new kits and maybe some bitz too. 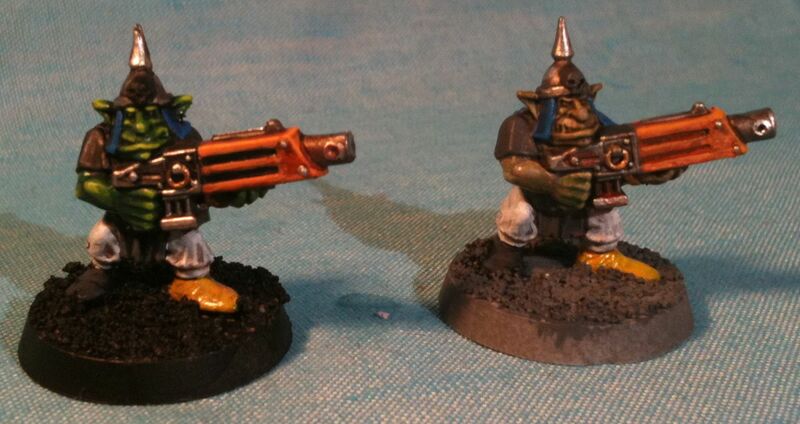 I through some more paint on the Gretchin, the metal bitz are done and I started on some blue fabric type tests. I used the Foundation Blue then the new GW Wash as I figured that is what most people would do. I later highlighted with an old pot of Lightning Blue. I discovered I like painting Brazen Brass way better over Black than over Grey, even after washing it. Painting Silver over Grey or Gunmetal is no problems. One of the paints I bought today is the darkest Vallejo metallic I could find. 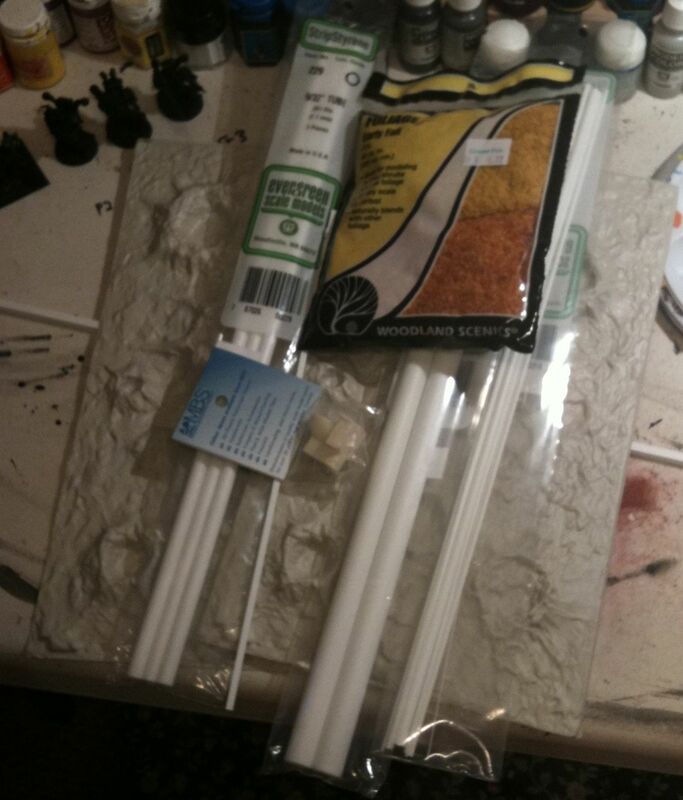 I also bought some Reaper Master Series paint, well one pot, and some Water Effects which I’ll use on my terrain tiles, which I hope to resume later this month. Stay tuned for lots more painting, but I really hope I get a job soon and have to fight harder for hobby and blogging time. I also hope I can get my sleep schedule normalized, we’ll see what the latest blood test reveals. Yesterday I started on three Gretchins, one with a black base coat and a traditional dark to light green skin highlighting technique, the other two with grey base coats and more experimental flesh painting. I couldn’t leave well enough alone so late last night I did another wash, this time of Gryphonne Sepia on just the two grey primered models. The first color I wanted to test painting over grey, was of course white. The easiest way I know to get a good white over a black base coat is to use Astronomican Grey then paint white over that. So that is what I did to the black primered gretchin. Actually the first thing I did was fix up the base coats, the black model required a lot less touchups than the wash heavy models. 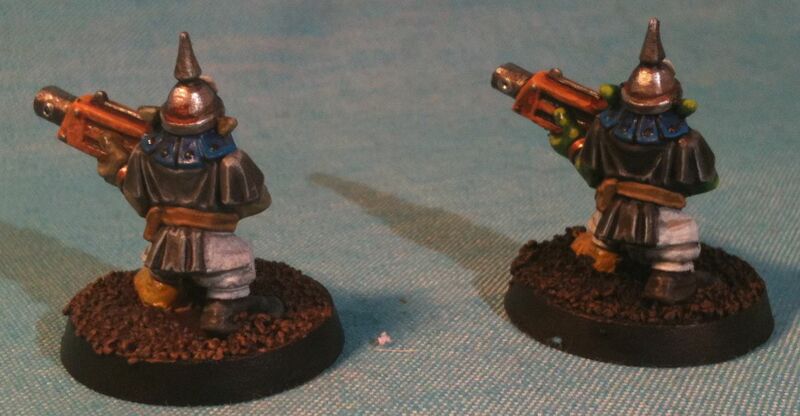 The final thing I did to this models trousers was to paint a tiny bit of Gryphonne Sepia into the recesses and creases. I may do another quick white highlight. 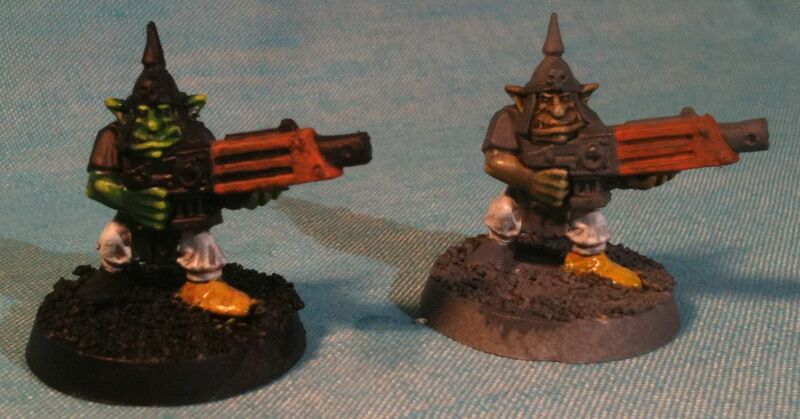 The better primed grey Gretchin, the one without the squig, also got white trousers. I just went straight Skull White over the primer. It didn’t work too well. I pressed on and mixed up a thinned down wash made from Codex Grey, this was applied liberally to the pants. This had to dry for a bit, so it was time to type and wait. After that I’ll definitely be painting another layer of white on the pants. The next hardest color to paint over black is yellow. This has gotten easier due to Iyanden Dark Sun. I used that right over the black. Over the grey I opted for Golden Yellow. This is an older pot that Owen gave me. It is a good darker richer yellow, but it is best to use it over another color even orange… However it went right over the grey OK… We’ll see how it looks after a wash and some highlights. Next for the black primered model was a coat of Golden Yellow, for the grey primered model I went with a thinned down orange wash made from Windsor & Newton Orange Ink. Next for the black primered model was Gryphonne Sepia wash on the yellow bootie. I did a highlight of Sunburst Yellow on the other bootie, this is an even older GW paint pot. Finally I got out my Badmoon Yellow paint pot and painted that on both booties. Neither is winning any prizes, I still think for painting yellow it is best to start from an orange or brown basecoat. The next color I wanted to try was Orange it also benefits from a Foundation color, but can still be a tricky color to get right, not as tricky as yellow though… I think the wooden part of the autogun will be orange on both models. You can see how the undercoat makes a difference on how a color looks when just using a single coat. I think that is about all that is going to get done this evening. I’ll try to work on them more tomorrow. Writing the tutorials and comparing the color combos makes things go slower. After a few more colors bone, brown, black, and grey plus possibly blue I’ll be mostly done and just blitzkrieg through. I stayed up late last night reviewing the big red book and revising my Warhammer Orks and Goblins army list. Basically I decided I didn’t need an ork general, I’m not trying that hard to win anyway. 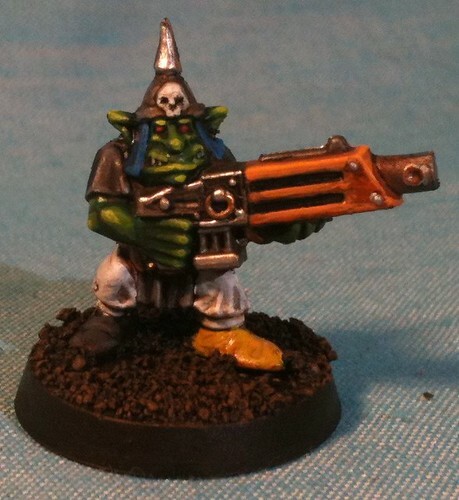 The only reason I wanted an Ork Great Shaman was for the improved leadership and access to the Big Waaagh spell list. I wondered if I couldn’t accomplish the same thing in another manner. I still could not afford a big unit of orks on foot, so I went with just the goblins, that’s right my entire 1500 point 8th edition army list has two orks in it. One is a Level 2 Shaman for access to the Big Waaagh spells, as some of them are very good, at least for Ork magic, the other is a bully leading my rock lobber crew. This army is more 8th Edition and even more so, the current O&G army book, I think I liked the previous ork and goblin army book better. Even though I’m not sure they are particularly combat effective I purchased all three of my warmachines and I will add to this arsenal as the army grows. How else are goblins going to hurt big tough things? The large block of spearmen was also non-negotiateable, if I ever get it finished, damn straight I’m fielding it, 345 points isn’t that much. With the 110 point Battle Standard Bearer it has the potential to deal out a lot of damage with all those poised attacks. I also discovered the Steadfast rule which will really help my goblins, especially at 2000 points when I get to add more Night Goblins and a big ork unit to the mix. Picking this army list took a long time as I agonized over the magic items. 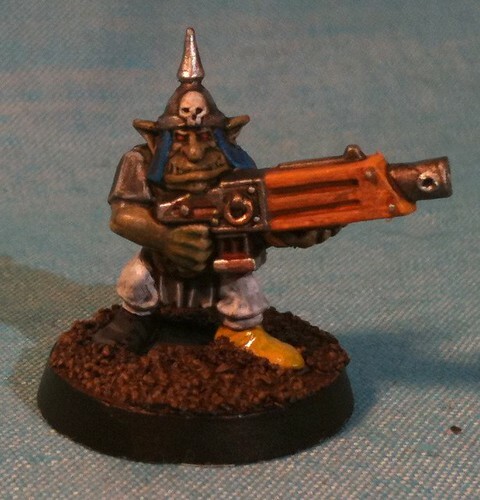 A lot of the more interesting items are Goblin or even Night Goblin only but there are a few good Ork only ones. There are also a lot of new common magic items which are often better/cheaper than the army list specific ones. At 2000 points I’ll have even more points for heros and magic items but I won’t be adding another lord choice I had to work hard to squeeze two Night Goblin Lords in at 1500 points. I don’t have a painted model for the Warboss, but I might have one in a blister somewhere. I have plenty of plastic goblins I can use for war machine crew. So having to buy one more goblin isn’t a deal breaker, besides there are some nice new models. I have at least 40 Orks laying about, as I always planned to do one big unit with choppas, but now I’m thinking of giving them shields for the parry. Yet more shields I’ll have to paint. Warhammer Fantasy Battle can real tire out a painter like me who likes individualistic models and usually does minor conversions and puts extra detail into his models. In yet more time wasting and avoiding doing the laundry I looked into Warhammer’s number one competitor, Warmachine. I’ve seen people playing it in stores, even yesterday people were playing it despite the fact 8th Edition just came out which is getting a lot of push from the local gaming store owner. Hordes and Warmachine basically have a new edition for 2010 too. Not sure if this is accidental or not. It’s big appeal besides not being part of the evil empire as some people call GW, is it requires less models. Of course most of the models are metal, but there are plastic starter sets now. I’ve long wanted to move more into skirmish games as the Diseased Sons, even the Nefarious Fire aren’t that portable. My Warhammer Fantasy Armies are worse as I haven’t played them in so long, I haven’t tried to transport them. 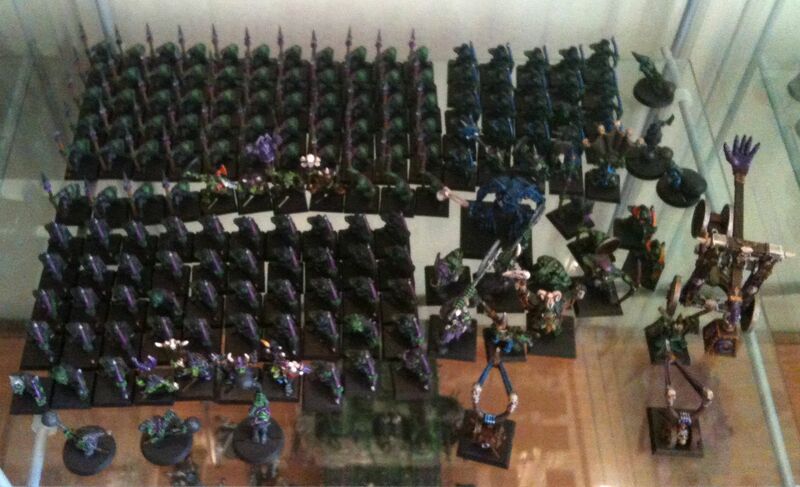 The best thing to do would be to buy a dedicated case for your armies which I’m going to do for the Servants of Decay. I have several miniature cases, some home made, others made by Charon and GW. I’m thinking of getting a Battlefoam one as they precut the foam for you, put spending money is an impossibility so to play Warhammer at Strategies I’ll need to figure out how best to transport stuff on monster bases. When I got the Charon case I ordered one bigger, monster sized, foam layer, but I’d actually prefer if my whole army fit in one small compact case. Hence the appeal of smaller, skirmish sized games. Skirmish games are more portable, which as an apartment dweller who currently can’t host games, I need to consider more and more. Warhammer used to be something you played in your parent’s basement, or if you’re lucky at a local club night, now it seems you need to travel to find opponents for the games you used to play with your friends. I don’t have a car so portability is a bigger and bigger deal for me. Something to work on in 2011, as I already have more than enough on my plate for 2010. I’ve been doing a little painting and now that it is evening hope to make some real progress. I still plan to finish the test models, hopefully in the next day or two. Then it is on to the Nurgle lesser daemons so I have a legal, if not necessarily effective, 1500 point Warhammer army. Then it is full speed ahead to finish my Astronomi-con Vancouver army. Wargamers World is a new online store promising OOP GW bits. One of the 40K blogs I followed recently painted one of GW’s modular plastic gaming tables. He found two other examples of people painting these, one used pastels err pigments. Well my computer seems to be having issues and it keeps getting later, tomorrow hopefully I’ll be more productive so I’ll have better photos to post online. I’m using my Cool Grey AwesomePaintJob.com wash and it is real hit and miss, the pigment separates in this, the red one, just like in all the old GW flesh washes pots I ever had. So yesterday was a busy day on this blog or was it the day before. I’m still waiting to hear back from a potential employer, I’m beginning to think I’m not their first choice. I ran into an old business contact from my previous job at the cafe, but where I spent my afternoon was at Strategies trying to price out a 1500 point Orks and Goblins army list from my existing painted miniature collection. I have well over 100 painted goblins but at 3 to 5 points a piece it only goes so far. I also have three warmachines which I can now use all in one small army and plenty of character models painted or could be quickly painted. I found another goblin shaman in my collection the other day, I really should move that model to the proper box… I’ve written a number of army lists in the last ten years, generally trying to get just 1000 points on the table lately, but now 1500 is the number for Darren’s (Strategies) 8th Edition Mighty Empires campaign so I decided to rank up my Nurgle deamons rather than paint 63 goblin shields and base them and do movement trays etc. etc. Apparently as of July 12th 2010 no one at GW headquarters thinks the Raggedy Red Banner is an issue. 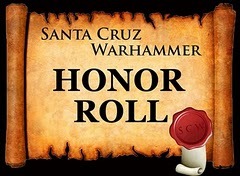 I now own the Big Red Book so I guess I’ll try to understand the problem, which apparently is Battle Standard Bearers now let you re-roll all leadership tests so the Raggedy Red Banner’s ability to re-roll panic tests is borked because there is some big overarching rule that says you can never reroll a reroll. I also learned today that you can have one of a Ward save or a Regeneration roll but not both, this affects my proposed big unit of plaguebearers some. So here is the 1500 point Ork and Goblin list I’m going to work towards someday fielding, it uses all three units of goblins I have painted, though some of them are not on the field at 1500 points. It requires the painting of the 63 shields, the basing of the entire army, the construction of various custom movement trays, the painting of some goblin crew with hand weapons and lastly the painting of 9 Ork Arrer Boyz, no one uses them so I decided since I have the figs I’d rather a small unit of them than a small unit of regular boys. My 2000 point list will have a horde of orks and likely another warmachine, bulked up Night Goblin units, and maybe a chariot or two. Goblins are like the antithesis of Chaos Daemons they cost so little each, you have so many options on what to do at 1500 points. I once read that O&G have the most CORE choices, if it wasn’t for warmachines my army would be all CORE and HEROs and LORDs. My glorious plan, assumes the other player is more clever, more maneurverable, and has better combos of magic items than me. My plan is to stand in a big green wall, with warmachines between my units to prevent the outbreak of violence and basically pepper the enemy with arrows, rocks, doom divers, and spells. If the opponent gets close to the big Night Goblin unit he gets amped up Fanatics. I wasn’t planning on maxing out on fanatics, that is all anyone seems to use Night Goblins for. Maybe at 2000 points I will max out, I have six painted. I will also bulk up both Night Goblin units so they look more fearsome and replace the arrer boys with a big unit of boys. But first I need to learn the rules, paint, base, make movement trays and learn what the Raggedy Red Banner actually does, anyone in my meager blog readership know? Maybe I’ll ask on the Waaagh. So loyal readers of this blog, both of them will know I’m working on my Astronomi-con army, my army for next year’s Astronomi-con, my terrain for next year’s Astronomi-con, and some WW1 guys to take full advantage of the modular trench table I’m building. So what’s this post about Warhammer Fantasy Battle doing on this blog? Well I honestly haven’t played Warhammer Fantasy Battle in over ten years, but I’ve been encouraged over the last decade to get my Orks and Goblins on the table, I have many of them painted, well over one hundred goblins. They aren’t the prettiest but they are usable with three exceptions. One they are not based or more correctly they are just on black plastic bases, two they spearmen really should have shields, so I have to paint 63 goblin shields, and three the rules have changed so many times over the last decade the army needs movement trays and a few goblin crewmen for the warmachines. In short it would take a lot of painting and work to get 1500 points of goblins on the battlefield. 1000 points was what I was shooting for before, but 1500 seems to be the magic number at Strategies. I went down to Strategies today, but no Darren. I did bring the army book to my other fantasy army. What other Warhammer Fantasy Army? I mean I haven’t played in over a decade… Well as Owen figured out over ten years ago I have enough Nurgle Daemons in the Diseased Sons to field a small fantasy army. However through the magic of over the top characters and 100 point magic items, my demons especially considering I’ve painted more over the last decade can easily make 1500 points. In fact 1500 points isn’t a very good number for using daemons in in WFB. You’re allowed to spend a maximum of 375 points on a Lord and the cheapest Lord is probably 300 points naked. Initially they tried to talk me out of it, but I’m all four one big unit of Plaguebearers. I bought a new box of command as initially I thought I needed to have at least two CORE choices, but apparently I need three units of anything instead. Beasts of Nurgle may actually be good as they have a movement of six, but I couldn’t afford to take all three, because I also wanted Nurglings. I’m going to need to re-base the Beasts of Nurgle, make one big movement tray, and paint two more plaguebearers by the 25th when Strategies new Warhammer Mighty Empires campaign starts. I totally expect to lose, but maybe 2000 points will be kinder too me. I plan to put the Plaguebearers in the middle, the Beasts on the right flank, the Nurglings on the left flank, with the Daemon Prince initially screened by the Beasts which might ‘hide’ him. I really don’t know all the rules, but as I said, “I have a PAINTED ARMY.” Most people play, I paint, surf the net, and now blog. 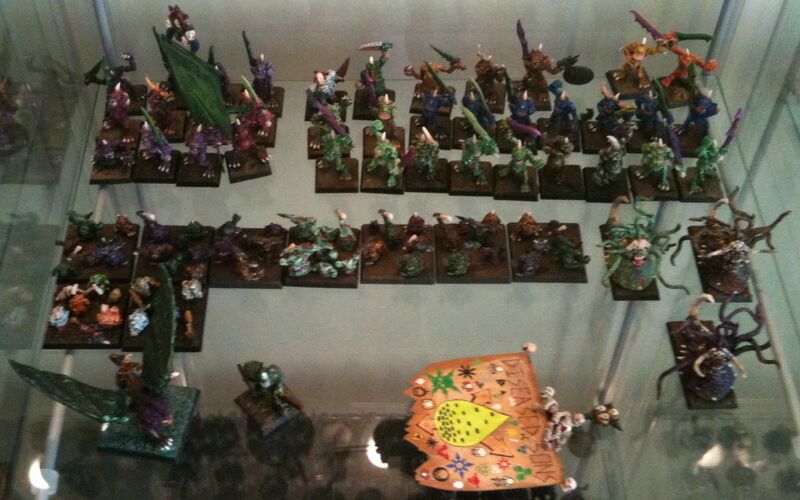 Oh and for the record Darren is old school, if you want to play in his store, your models have to be painted and based! I just did the math to grow to 2000 points I’d need to paint one Nurgling stand, as I’d allotted six more for two units of five, the third Beast of Nurgle and then made my Daemon Lord more expansive giving him the abilities of a Level 2 Wizard and the Trappings of Nurgle which will make him even harder to kill with a 4+ armour save and regeneration. I’m no WFB expert but all my attacks except for Daemon Prince are Poisonous, I’d get D3 extra combat resolution from my big unit and count all wounds as double combat resolution, and at 2000 points everything but the Nurglings has regeneration.